When we were creating our Smart Tabs Tape-In Hair Extensions, we wanted to use the highest quality material to create the best tape-ins on the market. This not only meant using the highest quality hair, but it also meant that we needed to find a tape that is residue-free and strong. It took our team months to find the right one as we tested countless tape-in tabs that would eliminate the possibility of residue. Introducing to you our Smart Tabs Tape, a revolutionary tape that doesn't require heat, easy to use, and less work cleaning up tape residue. 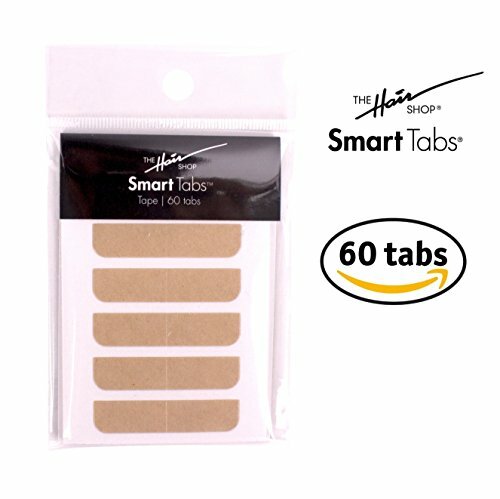 Our Smart Tabs Tape-Ins can be reused up to 4 times if the hair is well-taken care of. For the first replacement, you want to stack the tape on the first layer. When you replace the tape for the second time, you have the option to peel the tape previously applied before and replace the second layer or you can stack the tape again. We advise only stacking the tape up to 3-4 times before it gets too bulky. In addition to providing the highest quality 100% remy human hair extensions on the market, The Hair Shop also provides the tools and hair care that are necessary to maintain healthy extensions, wigs, and hairpieces. As a USA-based company with over 30 years experience in the industry, The Hair Shop is name Professionals can trust. We only use the best quality to ensure satisfaction to all of our customers. If you have any questions about this product by The Hair Shop, contact us by completing and submitting the form below. If you are looking for a specif part number, please include it with your message.